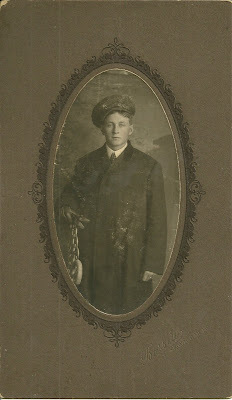 Photograph of Chester Cleveland Flanders in a uniform and holding an intriguing object. Perhaps a reader will be kind enough to forward an opinion. See the comments section. Chester was born December 25, 1884, at Mayfield, Maine, the son of Daniel and Clara Estelle (Jacobs) Flanders. Chester's paternal grandparents were Barnet C. and Susannah (Ford) Flanders. I haven't yet been able to find Clara Estelle's parents or even if Jacobs was actually her maiden name. Chester and Nancy lived in several towns in Somerset County, the county of their birth, and possibly at Augusta, Maine. There are records for four children born to them, but two apparently died young, a son in infancy and a daughter in her teens. Chester died in 1956 and Nancy Belle in 1958. They're buried in the Evergreen Cemetery at Solon, Maine. Men's room key. He worked at a gas station. You wrote that you had no information on Laura York (mother of Nancy Goodridge who was Chester Flanders wife) and had no information to confirm York was really her maiden name. Nancy Goodridge (Goodrich) was first cousin to my grandmother Gladys York, and I can confirm Laura York was her mother. 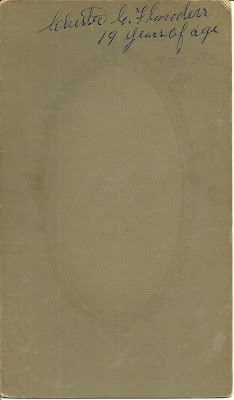 Nancys father, Wentworth was the son of Temple Goodgridge Sr. b 1817 d. 1904 and Nancy (unknown maiden name) b. abt 1812 d. 1886 Records for them vary between Goodridge and Goodrich and for Wentworth as also Wintworth and Winthrop. Thanks for the update! I'm amending the post to direct readers to your comment.